The launch of the new annual catalogue is only a few weeks away. This is a bitter-sweet time of year as we have to say goodbye to some old favourites but a huge hello to some amazing new goodies. 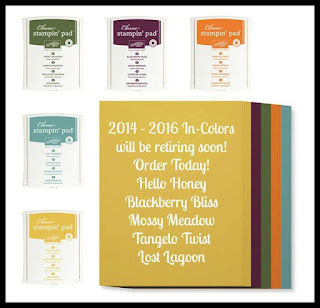 One suite of products that we always know are definitely going are the limited edition 'In Colours' and the departing colours this time are Hello Honey, Blackberry Bliss, Mossy Meadow, Tangelo Twist & Lost Lagoon. I for one will miss Lost Lagoon the most but am waiting with baited breath to see what replaces them.